Hello and welcome to the 127th installment of the SWD. Syrian Democratic Forces continue to clash with Islamic State in several districts of Raqqa city. Clashes in Al-Batani and Al-Barid districts reportedly left at least 16 IS’ fighters dead. At approximately 4:30 p.m. Syria time, June 18, Pro-Syrian regime forces attacked the Syrian Democratic Forces-held town of Ja’Din, South of Tabqah, wounding a number of SDF fighters and driving the SDF from the town. Coalition aircraft conducted a show of force and stopped the initial pro-regime advance toward the SDF-controlled town. Following the Pro-Syrian forces attack, the Coalition contacted its Russian counterparts by telephone via an established ‘de-confliction line’ to de-escalate the situation and stop the firing. At 6:43 p.m., a Syrian regime SU-22 dropped bombs near SDF fighters south of Tabqah and, in accordance with rules of engagement and in collective self-defense of Coalition partnered forces, was immediately shot down by a U.S. F/A-18E Super Hornet. Ja’Din sits approximately two kilometers north of an established East-West SDF-Syrian Regime de-confliction area. The Coalition’s mission is to defeat ISIS in Iraq and Syria. The Coalition does not seek to fight Syrian regime, Russian, or pro-regime forces partnered with them, but will not hesitate to defend Coalition or partner forces from any threat. The Coalition presence in Syria addresses the imminent threat ISIS in Syria poses globally. The demonstrated hostile intent and actions of pro-regime forces toward Coalition and partner forces in Syria conducting legitimate counter-ISIS operations will not be tolerated. The pilot of the downed SU-22 warplane was identified as Ali Fahed, he is allegedly in SDF‘s custody and is receiving treatment for his wounds. SDF and Syrian government reportedly opened negotiations for the safe return of the pilot. Syrian Arab Army captured Al-Resafa from Islamic State. Similarly, SDF captured Shuehan from Islamic State, north of Al-Resafa. On a front east of Ithriya, SAA captured Tell Masbah from IS. Activation of this front means that IS’ pocket east of Khanaser will form very soon. Hayat Tahrir al-Sham’s vehicle was targeted by an explosive device on the road between Armanaz and Al-Bara. Explosion reportedly wounded driver of the vehicle. 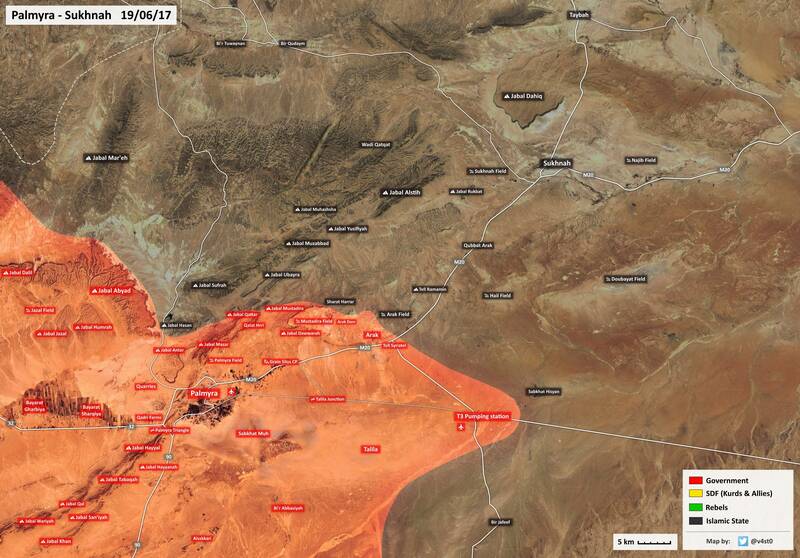 Syrian Arab Army reportedly captured T3 airport, and T3 pumping station from Islamic State, east of Palmyra. Jaysh al-Islam arrested several traders in East Ghouta, who are accused of belonging to/supporting Hayat Tahrir al-Sham. Humanitarian convoy jointly organized by the United Nations and Syrian Arab Red Crescent entered rebel-held Harasta in East Ghouta. Convoy consisted of around 40 vehicles and distributed aid to 11000 people. Jaysh al-Islam and Syrian Arab Army clashed around Hawsh al-Dawahirah, which is disputed between the two, the latter tried to advance in the area. Jaysh al-Islam was able to repel the attack and reportedly destroyed two SAA‘s tanks in the process. Syrian Arab Army captured Tulul Rabia from the Free Syrian Army factions. Tulul Rabia is located east of Al-Dakwa which was fairly recently captured by SAA. 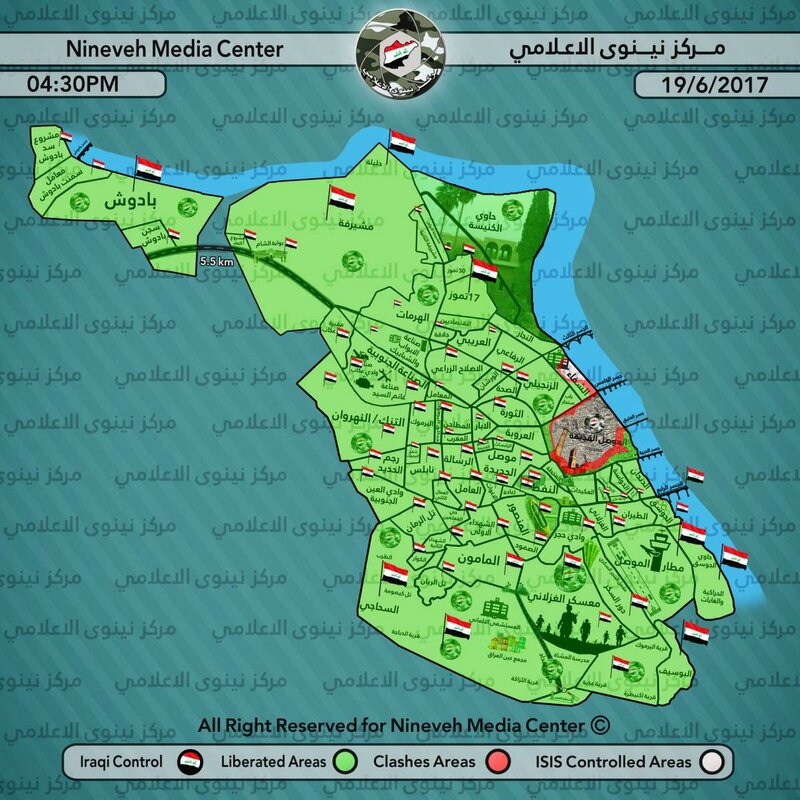 Heavy clashes erupted in west Mosul between Islamic State and Iraqi forces, as the latter tried to advance in Old Mosul district. Iraqi forces captured Al-Hadeen mosque and “Shimon” church in Bab al-Bayd neighborhood. Heavy clashes in west Mosul meant over a dozen of Amaq statements, some of which claimed death of 11 Iraqi soldiers and destruction of three vehicles during clashes in Ras al-Jadah neighborhood. According to Amaq, Iraqi forces in Ras al-Jadah were also mistakenly targeted by CJTF-OIR‘s airstrike, causing several casualties among Iraqi ranks. Amaq reported an SVBIED attack, death of two members of Iraqi Federal Police and destruction of a vehicle at the outskirts of Al-Mashahedah neighborhood. Foreign Islamic State’s commander from Egypt, Abu Bakr al-Masri, was killed by Iraqi Federal Police in west Mosul today. Al-Masri was reportedly in charge of IS’ units in Bab Jadid neighborhood, Old Mosul. Iraqi journalist, Bakhtiar Haddad, was killed by an improvised explosive device in the Old Mosul district. Three French citizens that were with him were injured in the attack. Islamic State launched an attack on Al-Ibrah al-Kabirah village, west of Tal Afar, reportedly killing 16 Al-Hashd al-Shaabi fighters and destroying two vehicles. Yesterday, IS’ improvised explosive device allegedly destroyed a vehicle carrying Al-Hashd al-Shaabi fighters on the road between Balad and Al-Dhuliya. On the 18th of June 2017 CJTF-OIR has conducted 15 strikes in Syria. CJTF-OIR‘s main focus in Syria at the moment is Tabqa-Raqqa-Deir al-Zour region where they did 13 strikes supporting SDF‘s operations against IS destroying nine IS oil stills, four vehicles, two fighting positions, two mortar systems, a VBIED, a tactical vehicle, and a heavy machine gun. Other area where two airstrikes occurred is Abu Kamal destroying two IS well heads. Full report on CJTF-OIR strikes conducted in both Syria & Iraq can be found here. Islamic State conducted a “sniper attack” in Marinot and Loid Cadayunan areas, Marawi, and reportedly killed four FIlipino soldiers. Furthermore, five Filipino soldiers were reported as killed by Amaq during clashes with IS in Mankado neighborhood. For those of you interested, you can follow us on an official Twitter account @SyrianWarDaily, or me personally on my biased twitter @joskobaric where I occasionally tweet some things.